We were fortunate to be chosen by Boeing as a recipient of their Employee Community Fund grant. It will go a long way to supporting our S.O.S (Safe Overnight Stay) Program- a service offered to families that are suddenly, and most often unexpectedly, facing homelessness. The program provides short-term housing and social services to the family, connecting them with county and state resources to help they find a housing solution to avoid the trauma and stress that homelessness forces on both the parents and children. 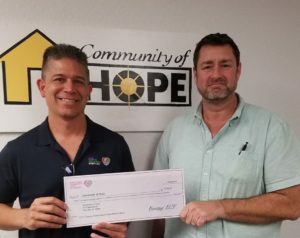 Our S.O.S program relies completely on the continued support of organizations such as Boeing and others who have been generous enough to help fund it. All of us are very grateful for Boeing’s support and look forward to continuing our relationship with them and others in our community in the future.